There are normally three ways to arrive at Guilin:1.by plane, 2.by train, 3.by bus/car. Guilin has only one airport which is located 32km away from downtown. For most visitors living far away, going to Guilin by plane is the best, sometimes the only choice. It takes around 40min from Guilin Liangjiang Airport to downtown, and vice versa. Including two express way toll booths on the road, it'll cost 90-120 yuan per taxi. Or you can take an aviation bus costing 20yuan/person. No shortcut, express way is the fastest way into the town. In Guilin some hotels can offer pick-up service with a little more pay or for free-charge. This kind of arrival fits travellers coming from China mainland, particularly for those who can conveniently take a through train. You may spend more time on transportation but probably cheaper than taking a plane. 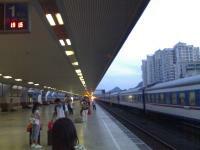 There're two train stations in Guilin. One is located pretty near downtown, another is in suburb about 15km away from downtown. Taking a taxi from the suburban train station to downtown will charge you about 20-50 yuan. Tourists from province or county nearby can choose a bus/car. A shuttle bus is more flexible than a train or a plane. I mean, the frequence of setting out of shuttle buses should be higher. So, a bus sometimes is well fit in with your timetable. Likewise, the bus terminal is close to downtown. As Rivers are used as scenic spot, you can't arrive at Guilin by a boat.You can only travel on a boat when sightseeing. Best choice will be made out by your own condition. So which way is the best for your transportation?